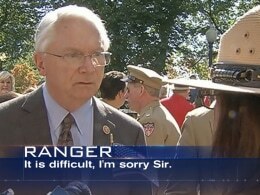 Rep. Randy Neugebauer, a Republican from Texas, angrily confronted a Park Service Ranger at the WWII Memorial in Washington, D.C., who was tasked with preventing members of the public who are not veterans from entering. NBC’s Brian Williams reports. >>> we want to show you something here. the following piece of video displays the anger and arguably the hypocrisy of the current situation in washington. this shows congressman randy neugebauer of texas, one of the people who favors the shutdown. he's confronting a u.s. park ranger at the world war ii memorial as if the shutdown is somehow the fault of the ranger. as you will see it was all too much for another bystander to take. >> people have traveled with their family. how do you look at them and deny them access? i don't get that. >> it should be difficult. >> it is difficult. i'm sorry, sir. >> park service should be ashamed of themselves. >> this woman is doing her job just like me. i'm a 30-year federal veteran. i'm out of work. >> no. it's because the government won't do its job and pass a budget. >> we are told the man who confronted the congressman and came to the defense of the park ranger is jim o'keefe, a veteran peace corps administrator now on furlough.